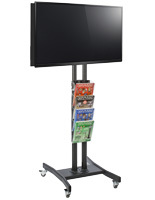 These Monitor Stands Allow for the Display of Posters! 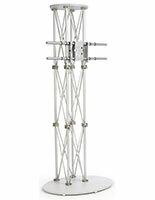 These Wholesale Monitor Stands with Bracket Sized for 46" Flat Screen TVs are In Stock Now! 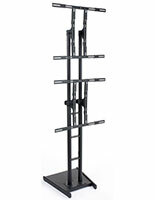 Buy Wholesale Flat Screen Television Stands Online and Save! These monitor stands feature an adjustable bracket that allows for the vertical or horizontal display of any television or monitor. This bracket also adjusts the height of your plasma or LCD television. 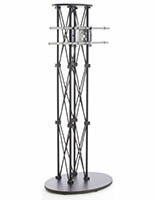 These flat panel plasma television stands, monitor stands are sent unassembled to ensure low shipping costs, but easily assemble in just a few minutes. 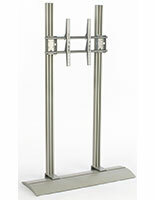 These durable aluminum monitor stands feature a satin silver color enabling them to match every décor. The durable flat screen television stand will also withstand years of use, even in high traffic areas. These stable units have (7) disc feet in the base to ensure it remains upright and stable while displaying your large format television. 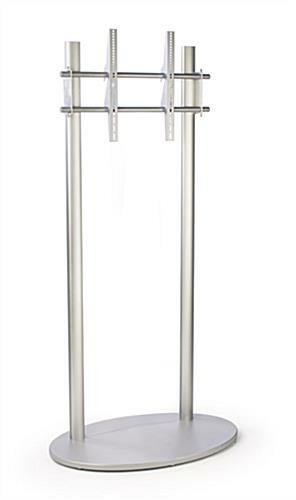 Flat screen plasma television stands, monitor stands, are perfect for retail store, office, trade show, and conference room use. 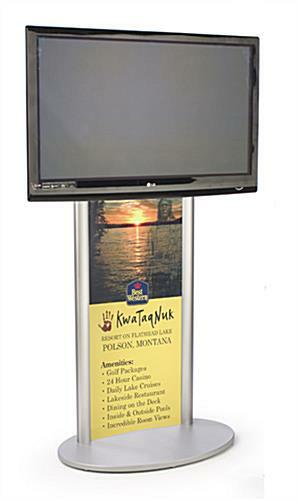 These monitor stands feature an enclosed base into which a 21-1/2" x 60" poster may be inserted. 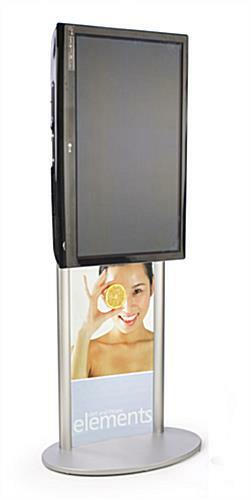 A non-reflective panel covering the poster keeps the poster safe from tampering while allowing it to be seen in various light levels. These wholesale monitor stands with bracket sized for 46" flat screen TVs are engineered with a VESA LG bracket that supports a 42" to 60" TV that weighs up to 80 lbs. VESA brackets are engineered with the assistance of television manufacturers to ensure they fit most televisions including NEC and LG. 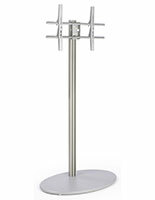 We include the required hardware with this stand to mount your television to the bracket. However, some manufacturers require special screws that are not included in the hardware kit but are available at your local hardware store. Please Note : Graphic is not included with plasma TV stands. When designing your images, keep in mind actual graphic size is 21-1/2"w x 60"h, where 1/2" on each side is covered. Your graphics should be printed on regular poster paper, so as to ensure they will fit securely within the grooves. This will not be a problem for any printing service facility.